Prison Compensation Claims How Much Compensation Can I claim? Accidents that result in a personal injury are quite common in a prison environment. Inmates are subject to the risk of injury, for which the prison service is responsible for guarding them against. Prison officers are also often victims of an accident at work, resulting in a personal injury. Because of the complicated nature of accidents in a prison, especially with regards to negligence on the part of the prison service, and the subsequent liability for compensation claims, getting proper legal advice is a must if you have suffered a personal injury in prison. We have developed this guide to claiming personal injury compensation for both inmates of a prison, and prison officers who work in a prison, to educate people, in order to help them press a successful personal injury compensation claim. A guide to how to claim compensation for prisoners. No win no fee prison compensation claims. How to start a prison injury claim. 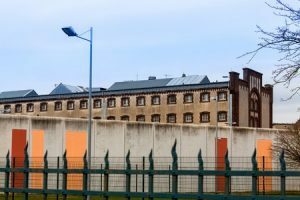 What damages can I claim for a prison injury or negligence compensation claim? Serious assaults in prison on the rise. Fewer prison officers means increased risk of injury. A direct correlation of staffing levels and violence in prisons. Claiming for an injury as an inmate. Claiming for an injury as a prison officer. How much compensation will I receive for a prison compensation claim? There is a very wide range of ways that accidents can occur in a prison environment. Both inmates and prison officers are in a tough, stressful environment. There is also the possibility of aggression from an inmate resulting in a physical assault. In effect, we have a veritable melting pot of potential accidents that could lead to a personal injury compensation claim. If you have been in prison, or currently are in prison, and have sustained an injury, then you may be in a position to claim compensation. The same applies for prison officers who have sustained an injury whilst carrying out their duties. In order to have the best chance of making a successful compensation claim, you need to be prepared and armed with the information you need. This guide will attempt to give you that information. It will explain how to make a claim, what kinds of things compensation can be claimed for and some guidelines on the amount of compensation that may be received. Not everyone has access to sufficient funds to pay for their own legal fees whilst pursuing a personal injury compensation claim. Indeed, for prisoners who are the victims of an accident resulting in a personal injury, it is highly unlikely that they will have the cash reserves to make a claim. Therefore, we have developed a No Win No Fee service, that has been designed to make sure that everyone who needs legal representation to make a personal injury compensation claim, has access to it, regardless of their financial situation. This type of Conditional Fee Agreement (CFA) is very easy to understand. You won’t need to pay us anything during the process of making a compensation claim for an injury sustained in prison. If we lose your case, you still don’t need to pay us anything. But if we win your case, we will take our fee from the compensation you receive. We are legally restricted to only charging as much as 25% of the total amount of compensation awarded. If you believe that you have reason to pursue a compensation claim following an injury that was sustained either as an inmate or a prison officer, then you are going to need some legal advice starting off. Was it an accident, or an assault that caused the injury? What kind of medical treatment have you received? Will there be any long-term or permanent health issues as a result of the injury? Once we have all of the details of the injury, we will then advise you on what to do next. In most cases, we will offer to take in your prison injury compensation claim under a No Win No Fee agreement. We will then pursue your prison injury compensation claim on your behalf, and attempt to get you the most compensation possible based on the details of your injury and how it has affected your life. When you make a compensation claim for a personal injury that was sustained in a prison, either as an inmate or a prison officer, there are two main categories of damages that you can potentially claim. These are general damages and special damages. General damages cover all of the physical aspects of the injury that you have suffered. It takes into account the actual pain of the injury, both at the time of the injury and on an ongoing basis. It also includes any considerations such as long-term loss of function, permanent scarring, and any other negative physical factors. Mental stress and trauma are also included in general damages. Special damages is a broad category that contains all of the non-physical aspects of a prison injury compensation claim. This includes financial hardship such as loss of earnings, and also the cost of out of pocket expenses such as travel, medical are and ongoing care in the home. This is the harder of the two categories to quantify, and no two cases are the same. When we make a prison injury compensation claim for you, then we will always try and get the most damages that we can. Our fee is tied to the compensation amount, so it is in the best interests of both parties to sue for the maximum amount possible. 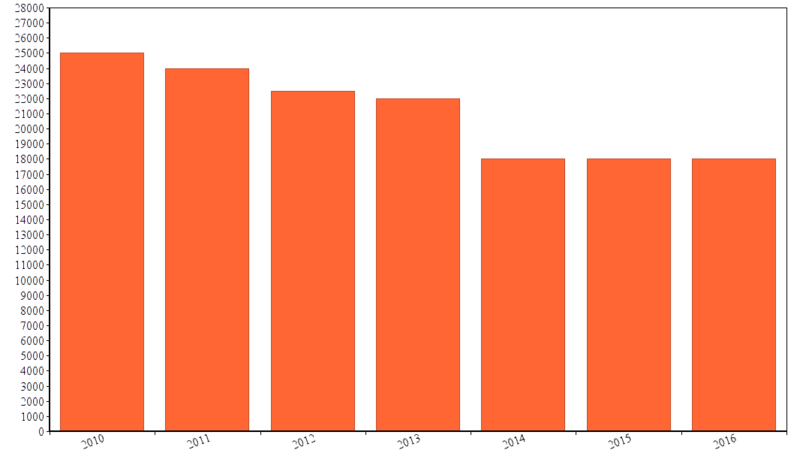 As can be seen from the graph below, in recent years the number of serious assaults that have taken place in prison has risen quite dramatically. When an assault is made on either an inmate or a prison officer, there exists the possibility that a personal injury compensation claim can be made. If you have been the victim of assault either as an inmate or a person working in a prison, we can help you make a compensation claim. 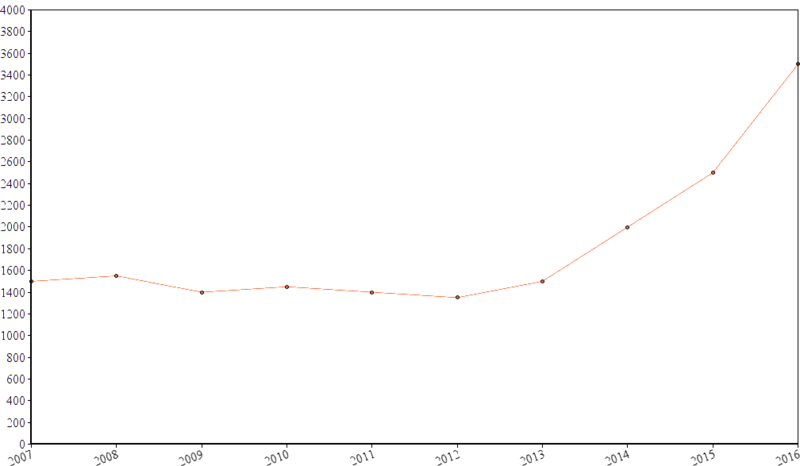 As we have shown in the above graph, the number of assaults that take place in prison is on the rise. Yet at the same time, the number of prison officers has dropped significantly since 2010. This results in a much riskier workplace. Not only are prison officers now more likely to be the victim of assault leading to a personal injury, they now have to work harder to make up for staffing shortfalls. This means that the risk of being involved in some kind of accident at work which could result in an injury is now much higher. In order to visualize how significant, the increased risk of being exposed to some form of violent assault is the graph below plots active prison officers alongside recorded cases of violence to both prison staff and inmates. It can clearly be seen that there is a direct correlation between lower staffing levels and increased risk of assault. 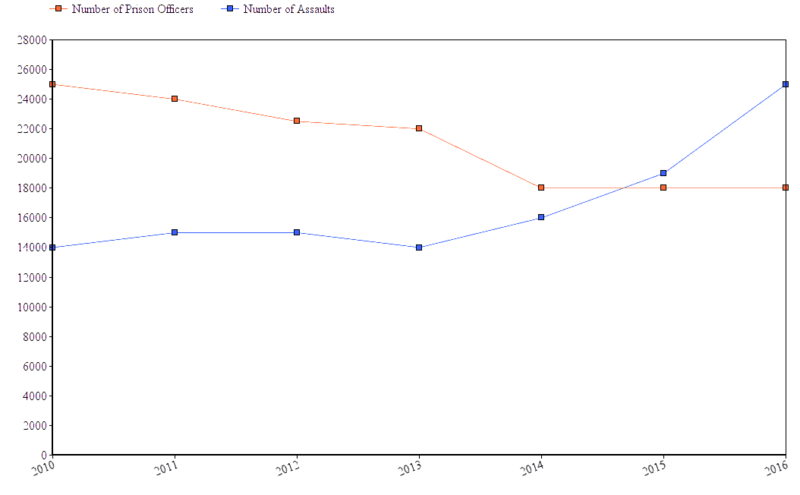 As the number of prison officers has declined, the number of reported incidence of violence has risen. This means that we are reaching a time when there will be many more personal injury compensation claims being made by either people working in prisons, or people held in them. Finding a solicitor that has the experience necessary to successfully make a prison injury compensation claim is going to be crucial in these cases. Decreased workforce & increased risk of assault. A slip or trip – on a wet or badly maintained floor surface whilst in prison. Work accidents – injuries that are a direct result of an accident that occurred whilst you were performing work in prison. Injuries sustained through assault – if you were attacked by another prisoner. Medical or dental negligence – if you sustained an injury whilst receiving medical treatment or dental care whilst in prison. Compensation for wrongful imprisonment – if you have been wrongfully imprisoned for something you did not do you can claim compensation. The prison service has an obligation to keep inmates safe at all times. This means that you should be protected from injuries caused by accidents due to negligence on behalf of the prison operator. The prison service is also responsible for making sure you are safe from other prisoners at all times. So, if you suffer an injury whilst in prison, and it is not your fault, then we can likely help you make a personal injury compensation claim. A slip or trip accident – caused by a damaged or badly maintained floor, or even a wet or slippery floor due to spillage. Muscle strain or sprains – this includes back and spinal injuries, that are a direct result of having to carry out heavy work. Assault by an inmate – injuries caused by an attack against the prison officer. Additionally, prison officers may also be able to claim special damages as part of their personal injury compensation claim. If there has been a loss of earnings or other financial hardship encountered as a direct result of the injury. Although each personal injury claim for compensation as either an inmate of a prison or a prison officer working in a prison will be different, below you will find some aggregated compensation amounts based on historic data regarding real payments. Toe Injury Severe - Moderate £4,500 - £43,250 Amputation of multiple toes at most severe, down to a loss of a single toe as least severe. Foot Injury Mild £5,300 - £11,050 Short-term damage to foot and pain as result of the injury. Foot Injury Moderate £18,500 - £52,900 Long-term loss of function of one or both feet, with an ongoing disability as result of the injury. Achilles Moderate £5,300 - £30,100 Loss of function of the ankle over the long-term, possibly with ongoing pain as a result of the injury. Ankle Injury Severe £10,300 - £53,100 Loss of function of ankle, long-term pain, or requiring surgery to correct as a result of the injury. Knee Injury Minor £4,750 - £19,600 Short-term damage to the knee, causing loss of function or pain as result of the injury. Knee Injury Moderate £20,250 - £33,200 Long-term damage to the knee, resulting in loss of function and ongoing pain as result of the injury. Knee Injury Severe £39,700 - £72,970 Permanent loss of function or one or both knees as result of the injury. Leg Injury Minor £1,800 - £17,900 Break or fracture of one or both legs that will heal over time as result of the injury. Leg Injury Moderate £21,750 - £104,100 Loss of function of one or both legs as result of the injury. Finger Injury Severe - Minor £375 - £69,330 Amputation of one or more fingers down to minor sprains causing short-term pain as result of the injury. Wrist Injury Severe - Minor £2,550 - £44,500 Complete loss of function of both wrists, down to minor sprains causing short-term pain as result of the injury. Hand Injury Minor £700 - £22,300 Bone fracture, tissue damage of short-term loss of function in one or both hands as result of the injury. Hand Injury Moderate £22,500 - £47,750 Reduced function of one or both hands as result of the injury. Elbow Injury Minor £3,100 - £9,750 Short-term partial loss of function of the elbow as result of the injury. Elbow Injury Moderate £11,400 - £23,900 Partial loss of function of the elbow as result of the injury. Elbow Injury Severe £29,200 - £42,250 Complete loss of function of the elbow also covers surgery required as result of the injury. Arm Injury Minor £4,500 - £30,250 Short-term restriction of movement of arm or pain as result of the injury. Arm Injury Moderate £30,100 - £99,750 Loss of function of both or one arm, or ongoing long-term pain as result of the injury. Shoulder Injury Minor £350 - £6,700 Short-term restriction of movement of arm or pain as result of the injury. Shoulder Injury Moderate £6,250 - £9,750 Limited movement of the arm as result of the injury. Shoulder Injury Severe £9,500 - £37,00 Impaired movement or numbness of arm as result of the injury. Neck Injury Minor £1,800 - £ 6,200 Short-term damage to neck such as whiplash as result of the injury. Neck Injury Moderate £29,600 - £42,300 Long-term damage restricting movement and causing pain as result of the injury. Neck Injury Severe £35,500 - £112, 450 Severe pain, impairment of movement or paralysis as result of the injury. Back Injury Minor £350 -£9,850 Temporary damage to the back, with short-term pain as result of the injury. Back Injury Moderate £30,750 - £8,750 Damage to back, with long-term ongoing pain as result of the injury. Back Injury Severe £29,750 - £123,300 Loss of motor function or paralysis as result of the injury. Eye Injury Minor £1,600 - £7,600 Temporary vision impediment as result of the injury. Eye Injury Moderate £7,100 - £49,400 Seriously reduced vision in one eye as result of the injury. Eye Injury Severe £81,200 - £205,300 Loss of sight in both eyes, or one eye and partial loss of sight in the other as result of the injury. Ear Injury Minor £4,300 - £37,500 Hearing impediment as result of the injury. Ear Injury Moderate £22, 300 - £34,500 Deafness in one ear as result of the injury. Ear Injury Severe £69,100 - £108,500 Total loss of hearing as result of the injury. Face Injury Minor £1,700 - £12,350 Scarring until fully healed in the mid to long-term but not permanent as a result of the injury. Face Injury Moderate £12,200 - £27,300 Breaks and fractures to cheeks, jaw or nose as well as ongoing pain as result of the injury. Face Injury Severe £15,400 - £73,200 Permanent scarring as result of the injury. Head Injury Minor £1,500 - £9,500 Damage to the head that did not result in brain damage as a result of the injury. Head Injury Moderate £12,500 - £200,00 Injuries that result in impaired mental ability, change in personality of loss of motor function. Head Injury Severe £215,000 - £310,000 Injuries that leave the victim in an unresponsive and in a vegetative state due to severe brain damage. On top of these compensation amounts for personal injury claims, there is also the issue of special damages to consider. Special damages will always be entirely unique to each individual case. Therefore, it is impossible to give any rule of thumb or guidelines on the amount that could be received. If you are an inmate who suffered a personal injury whilst in prison or a prison officer who suffered a personal injury whilst working in a prison, you may have a valid reason to make a compensation claim. The prison service is liable in the event of a personal injury that was caused by something they are required to maintain or guard against. Additionally, if you were the victim of an assault by a prisoner, you may also have a valid reason to make a compensation claim. If you have suffered a personal injury in a prison, then you really need to contact us. Even if you do not think that anyone but yourself was to blame, you may be able to make a liability or negligence claim against the prison. We make the entire end-to-end process of making a claim for personal injury compensation as simple as possible. We start with a short, free consultancy session to gather the details of your case. Once we have all the facts, we will recommend a course of action. In most cases, we will take your claim for compensation on as a Conditional Fee Agreement (CFA). This is a No Win No Fee type of arrangement. You won’t need to pay any ongoing legal costs across the lifecycle of your claim. If we fail to win compensation on your behalf, then you don’t pay us anything. If we do successfully claim personal injury compensation for you, then we will take our fee out of that. The most we can legally charge is up to 25% of the compensation you are granted. The remaining 75% will be yours.